For the best water heater installation and repair services in Bethesda, you can count on the local experts at Master Plumbing. Bethesda is a great community to live in. Located just northwest of Washington D.C., Bethesda was ranked number one overall on Forbes’ list of America’s most educated small towns in 2014. And if you live in the area and have plumbing problems, you can rest easy knowing that a top-ranked service is located right here in your backyard. Master Plumbing, your local Bethesda plumbing experts, has received recognition from Angie’s List for plumbing and drain cleaning every year since 2007 and has received the best plumber aware from Best of Bethesda. Here are a couple of the essential plumbing services we offer to homeowners in the Bethesda area. Water heaters are a cornerstone of modern living. 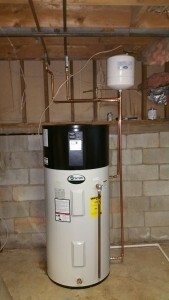 The water heater you choose for your Bethesda home should meet all of the demands of your appliances and family, but also work in an efficient manner to save you money on your utility bills. Whether you need a conventional tank water heater, a tankless, on-demand model, a solar-powered heater, or another variety, Master Plumbing is here to help. We can assess your home’s unique needs and come up with a solution to fit them. We offer water heaters from a variety of trusted companies such as AO Smith, State, and Bradford White. And when your water heater needs repairs, you can count on Master Plumbing to diagnose and fix the problem quickly so you can get back to your everyday routines! During the sometimes harsh Bethesda winters, home heating is another critical consideration. While traditional heating systems are wasteful and send warm air into the atmosphere, condensing boilers are now available to homeowners which provide a highly efficient solution to your home heating needs. In addition, installing a combination boiler gives you the utility of a home heating unit and a water heater in one advanced system. Master Plumbing specializes in the installation and maintenance of condensing boilers to aid in the heating of your home while saving you money on your utility bills in the winter! No matter what kind of plumbing services you may need in Bethesda, you can rest easy with Master Plumbing working on your home’s plumbing. We will give you a fair price for the work that we do and pride ourselves on our honesty, integrity, and courtesy. Your satisfaction is our number 1 priority! Give Master Plumbing a call at (301) 650-9100 or contact us online to get more information on how our expert plumbers can help you with your Bethesda home’s plumbing system. We have received Angie’s List Super Service Award recognition for plumbing and drain cleaning every year since 2007, in addition to the Best Plumber award from Best of Bethesda. We are fully licensed, bonded, and insured and our service is unparalleled. Give us a call today—you won’t regret it! To see examples of our projects, follow us on Facebook, Twitter, and Pinterest.